The internet phenomenon of sharing cute videos of cats is to be celebrated in the "world's first" film festival dedicated to viral felines. The Internet Cat Video Film Festival is set to take place on 30 August in Minneapolis, in the US. The event is described as a chance for people to come together and "LOL [laugh out loud] in the presence of others". Organiser Katie Czarniecki Hill said fans had until 30 July to nominate their favourite clips to be shown. "I could not be more excited to literally bring this solo cat video viewing behaviour out in the open," Ms Hill wrote in a blog post announcing the event . "Traditionally, we send these viral gems to one another via email or share them through various social media outlets. "Some viewers (yours truly included) spend precious free time trolling the interwebs for hilarious 30-second clips of feline tomfoolery." Videos of cats online have come to symbolise the internet community's fondness for amusing quick-hit entertainment. 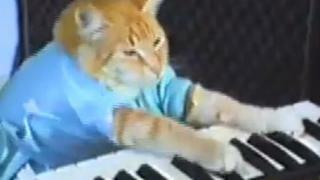 Stand-out examples include Keyboard Cat, a clip originally recorded in 1984 showing a cat "playing" a tune on the keyboard. It was uploaded to YouTube in 2007 , and has since had over 25 million views. Thousands of remixes and reversions of the clip have seen it immortalised further, with even a dedicated website following its use. The site, which is said to receive more than a million hits every day, was sold in 2007 for a reported $2m (£1.3m). It has since evolved into the Cheezburger Network, a collection of other sites based on a similar format. Its owners raised $30m (£19.3m) in funding from investors last year. One viral video expert told the BBC cat videos would always remain popular among internet users. "At some stage in the early internet it was just discovered that if you animate any kind of image of a kitten doing a dance then it was a universal language of joy," said Ed Robinson, creative director at London-based agency The Viral Factory. "It works across all cultures, all languages... and we are genetically tuned to have an emotional response to cute animals." While dogs have enjoyed considerable viral success - a "talking" dog was the most viewed YouTube clip in the UK last year - some say cats rule the internet. "There are theories that dogs are making a resurgence," added Mr Robinson. "They've been busy chasing sticks - but the cats have been at the forefront of the cultural movement. "The internet loves the idea that cats are in the know. "They've got the answer, and they might just tell us some day."